Last night, Mr. H and I found ourselves at the brand new Parker's Downtown in The Kimpton Schofield Hotel across the street from Heinen's on East 9th. Now, valet parking is $20* (yikes), but you can usually find a spot in a nearby parking lot/garage, or if you're lucky...snag a meter on the street, like we were able to do. *Editor's Note: The restaurant contacted me and clarified that valet parking is discounted to $12 for restaurant guests. We did tell the valet attendant that we were headed to the restaurant, and he quoted us $20. So just beware, and know in advance to question it if they don't offer the discounted rate. The restaurant calls itself "classic American" with a field-to-plate philosophy. My impression of the menu? Not overwhelmingly large, varied, and about 2/3 of the mains ($15 - $40) were tempting me. A good sign. Mr. H went with the Parisian Gnocchi ($17), a daily preparation. That night, it was a vegetarian version, and it was so creamy and rich that I couldn't help but steal TWO bites of it. It had broccoli rabe and mushrooms, all soaking up the cheesy sauce that had a touch of BBQ sauce in it. It really gave the sauce a hint a sweetness to it that was quite good. I was torn between the Smoked Pheasant ($30) and the Roasted Pork Belly ($22). I let our server choose, and she said that the Pork Belly was one of her favorite dishes. The menu listed it with ash ravioli, parsnip, miso broth, brussel leafs, and gremolata. The pork belly had a crisp outer layer, pulled apart easily, and the fat just melted in my mouth. The miso broth was nice, and the whipped parsnip really brought it together. But, try as I could, I could not find the ash ravioli on the plate. So, I asked. The manager came over and explained that the ravioli just wasn't holding up the way that the chef wanted, so they had removed it from the dish and an updated menu was coming out next week. They've only been open about two months, and the chef is tweaking the dishes as needed. I totally appreciate that he's not going to serve something if it isn't up to his standards. I appreciated the explanation, and was glad that I wasn't crazy and just didn't see it on the plate. Service and wine/cocktail menu were both really good. No complaints here, and I'll go back. I really do love when hotels kick their restaurants up a notch. Cleveland is doing alright in that area. When you travel, you really do appreciate how fortunate we are to have some good restaurant options within hotels here. Add this one to the list. Mr. H and I also attended another event this past week. We headed out to the Chagrin Valley Hunt Club Polo Field in Gates Mills for the annual Chefs Unbridled to benefit the Fieldstone Farm Therapeutic Riding Center. The setting of this event is always a memorable one, under a gorgeous tent with grassy floors and stunning lighting. We lucked out, and were seated right next to one of my favorite guys...chef Adam Bostwick of Graffiti: A Social Kitchen and Cork & Cleaver Social Kitchen. We had fun watching him finish off the meat outside. Their station was featuring a build-your-own slider, with all sorts of interesting housemade pickled items, sauces, and slaws. Another highlight was the lamb dish from chef Jim Blevins of Butcher and the Brewer. They were pulling and grilling housemade naan right there at the station. So good! In addition to the chef stations inside of the tent, attendees also got to sample dishes from the Driftwood Catering food truck and dessert at a cupcake food truck. We headed out there in between the sprinkles that evening. The event raised funds and awareness for the riding center, which serves students of all ages with a variety of special needs and provides much-needed therapy. We were welcomed this year by students and two miniature horses at the entrance, a wonderful addition to the event that highlights their important mission. Guests also enjoyed live music, a silent and live auction, a new wine pull, travel packages, and the opportunity to donate through the fund-the-mission. I'm continually impressed by how generous and dedicated the attendees are at this event. It's always a nice evening out, and this year's event did not disappoint! Disclosure: I was provided with two tickets to this event in exchange for two blog posts. All opinions are 100% my own. The folks at the newly opened REBol in Downtown Cleveland invited me in to do a tasting of their menu. Owned by the group behind Townhall, I was happy to accept, and was interested in seeing what their new fast-casual concept on Public Square was all about. Serving breakfast, lunch, and dinner, their menu focuses on building your own "bol" of ingredients. There is a handful of tables, bar stools, and outdoor picnic table dining available. A lot of takeout is done as well, since it's situated in a hub of Downtown business. ...and locally made Old City Soda. In addition to being able to build your own bol, the menu has 8 signature rebols, 3 broth bols, and side dishes for lunch and dinner. Breakfast focuses on some egg sandwiches and pastries (locally made). For the tasting, we were provided with three of their signature rebols to sample. Tuna Poke ($9) with sticky rice, harissa yogurt, papaya slaw, spiced cashew, scallion, and sunshine tumeric vin. Pulled Pork ($7.50) with sticky rice, cabbage slaw, soda BBQ, jalapeno, and toasted sesame. REBol Chicken ($7.50) with sticky rice, tikka masala, kale slaw, and scallion. Each one was truly done well, with plenty of flavor and freshness. Each is served with wonton chips, and they made a great vessel. It was a lot of food for under $10, and I'd happily order any of the three again. The Pulled Pork was the standout though. Truly, the only thing that I didn't care for was the papaya slaw side with the Tuna Poke. It just wasn't as interesting as the other sides. When you build your own, you can use sticky rice, salad, zoodles, or miracle noodles as a base. We weren't quite done though. We were offered a Peanut Butter + Honey Milkshake ($7.50). Quite full from our meal, we asked to split one. I immediately regretted my decision. This milkshake was INSANE. I've seriously had dreams about it since last week. I need another one, soon. Luckily, they are working on a food delivery partnership, and expect to have one established shortly. Townhall has been a go-to for us when ordering out and craving something healthier than pizza or Chinese (via delivermefood.com). Now, we'll have to add REBol into the rotation. The restaurant offers speed, fresh ingredients (non-GMO, organic), and a great price point. Dining Deals Alert! Go check it out for yourself, and spend some time in the newly refreshed Public Square too. Disclosure: I was provided with all food and drink in exchange for this post. All opinions stated are 100% my own. Last night, Mr. H and I attended the 2016 Taste of the Browns to benefit the Greater Cleveland Food Bank. Food Bank supporters, Browns fans, and foodies alike gathered to raise awareness and funds, and the event exceeded its fundraising goal by raising $226,000 for the Food Bank. Just incredible. We got to have dishes from some of our favorite restaurants, like AMP 150. Their hotcake was a sample of the new brunch menu, and it certainly made me want to head over there to try it out. I also got to try samples from restaurants that I haven't had before, like Yuzu. I really liked their Korean Beef dish (pictured top left below). You always have to plot your stops wisely at this event. Attendees also had the opportunity to bid on auction items, including a ton of Browns experience packages and memorabilia. There were also dining packages, a Vitamix, spa packages, family outings, Indians tickets, artwork, and more. I lost out on the two dining packages I was bidding on. Next time! One of the event's highlights is that guests can step outside into the quiet stadium. It's so peaceful to sit for a moment in the empty stands. I always enjoy this event, and the Food Bank is a cause near and dear to my heart. Congratulations to their staff on a job well done, and thank you to all of the donating restaurants and beverage purveyors that filled our bellies! Many in our community go hungry every day, and this event raises important awareness and funds to help the Food Bank with their mission work in Northeast Ohio. On Thursday, October 6th at the Avon Oaks Country Club, the Arthritis Foundation will host the 19th annual L'Amour du Vin. Guests will indulge in an exciting evening of sampling fine wines and delectable cuisine from the best restaurants from Lorain County & Cleveland’s west side! More than 450 attendees comprised of influential social and business leaders, healthcare professionals, corporate leaders including their clients or staff, and philanthropic supporters of the Arthritis Foundation attend the event. Features include an exclusive VIP Lounge, a unique silent auction, exciting raffles and more. One of the reasons that I've really enjoyed this event in the past is that it exposes me to restaurants that I haven't tried before or that I don't usually see at charity events. This year, I'm looking forward to dishes from 87 West, Parker's, Market, and Heck's Cafe. Mr. H will be pumped to see BOMBA, because he loves anything in a tortilla. Event proceeds support local programs and services for the nearly 1.3 million Northeast Ohioans with arthritis and fund critical arthritis research. Tickets are available at www.arthritislamourduvin.com and are $75 for General Admission or $95 for VIP Lounge. Group tickets and sponsorship packages are available. Contact the Arthritis Foundation today for more information. Or, you can win two General Admission tickets right here. Just use the form below for multiple ways to enter this random giveaway. Don't forget that you can tweet daily for additional entries! I will select a winner on Friday. Disclosure: I was provided with four tickets to the event in exchange for the ticket giveaway and an event recap post. All opinions are 100% my own. I'm totally falling more in love with our neighborhood, Old Brooklyn. Which is a good thing, because Mr. H and I are in the process of purchasing our "forever" home there. More on that to share soon, hopefully! One of the reasons I'm falling more in love with this Cleveland neighborhood is that the Community Development Corporation has launched this #whatsyouroldbrooklyn campaign, and they've received grant funds to host a variety of special events in 2016. That included an amazing Farm2Table Dinner in the Ben Franklin Community Garden last Friday evening. This 5-acre community garden is the largest in the state of Ohio, and it made for a perfect event backdrop. Chef Joe Horvath from Toast (a new Old Brooklyn resident with his wife Jen) provided appetizers for the cocktail hour, and then a fantastic four-course family-style meal. Much of the produce was harvested right from the community garden. Attendees got a front-row seat to witnessing their talent. ...a pork collar that reminded us of Ribeye steak, and the star of the evening...a plum tart that was to die for! All of this was paired with beers from Goldhorn Brewery. The brewer's wife happens to work for the OBCDC, and they're both big supporters of the neighborhood. We also enjoyed live music, and cheese from the Old Brooklyn Cheese Co. that is about to open in October. 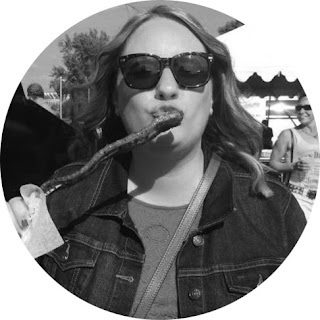 Easy access to a cheese shop makes this cheese-lover VERY happy. Walking distance, folks. That might be trouble. They are working on a restaurant pop-up event at Gyro Guys this fall, so stay tuned. The CDC is doing a great job of highlighting the neighborhood, involving businesses, and making residents (and non-residents) fall in love with this gem a little more. Me included. Nothing to disclose here, Mr. H and I purchased tickets to this event, and continue to support the neighborhood we call "home." A friend and I headed to the new Lakewood restaurant, Salt + a restaurant, last week. I was really looking forward to checking out chef Jill Vedaa's (formally of Rockefeller's) spot. It's located in the old Pug Mahones. I had never been, so I have nothing to compare it to, but the interior of Salt is thoughtful, industrial yet warm, and full of visual details. There is a great little bar/lounge area just inside the door, and then diners in the main dining room have a view of the small open kitchen. The menu consists of three categories: Vegetables, Fish, and Meat. All of the dishes in each category are small plates, and intended for sharing. And sharing is exactly what we did. Two from each category! Not pictured...the two desserts we split. A fried angel food cake with lemon curd and fresh berries, and a butterscotch pot de creme. Both great, and a highlight of the meal. Overall, there wasn't a dud on the table, but the Shrimp really stood out to me. I also really liked the kimchi and the smoked squash with the short rib. Service was attentive, knowledgeable, and very friendly, and also allowed us to take our time and gab and graze for three hours. We had a lot of catching up to do. I had first ordered a craft cocktail, the Amelia, and it was uber-strong. I had to switch to a glass of wine to ease in. I discovered a new-to-me wine that I liked...in a can! Underwood Rose from Oregon ($6 for the can, which is about 2 generous glasses of wine). Now I'll have to go hunt it down. I really enjoyed my experience there. Go check it out for yourself. Currently, they only accept reservations for parties of 6 or more. Beware that they are closed on Tuesdays, but you can also try their Sunday brunch. The third annual American Cancer Society Harvesting Hope gala will be held in the Cleveland Botanical Garden on Monday, Monday, September 26, 2016. 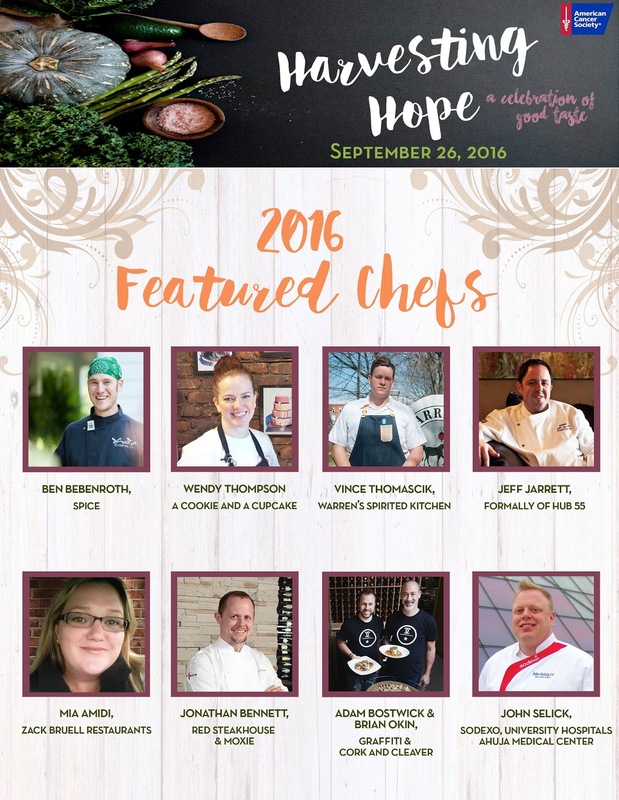 The celebration of good taste will begin at 5:30 P.M. with a VIP Reception where guests will mingle with celebrity chefs and learn more about the Hope Lodge. Dinner will begin at 6:30 P.M. with chef stations and tastings offered from Brick and Barrel Brewery and Tito's Handmade Vodka followed by a live auction, silent auction, live music and a special Cleveland Hope Lodge guest speaker and mission moment. This event is featuring some of my local favorites, like Jeff Jarrett of US Foods, Ben Bebenroth of Spice, Adam Bostwick and Brian Okin of Cork & Cleaver and Graffiti, and Wendy Thompson of A Cookie and A Cupcake (my favorite cupcakes in town!). All serving dishes in the stunning setting of the Botanical Gardens. All funds raised at Harvesting Hope will benefit the lifesaving mission of the American Cancer Society, and support the American Cancer Society Joseph S. and Jeannette M. Silber Hope Lodge community in Cleveland. For more than a 100 years, The American Cancer Society has been leading the fight to end cancer. They have helped usher in an era where more people survive cancer than ever before. By translating research findings into action, they've seen a 20% decline in US cancer death rates since the early 1990s. Almost everyone has been touched by cancer in their lives, and it's an important fight. The American Cancer Society Hope Lodge program provides free overnight lodging to cancer patients and their caregivers who have to travel away from home for treatment. Not having to worry about where to stay or how to pay for it allows patients to focus on the most important thing: getting well. Since opening its doors in 1995, the American Cancer Society Joseph S. and Jeannette M. Silber Hope Lodge community in Cleveland has provided more than 180,000 nights of free lodging to more than 5,600 patients and their caregivers. Individual Tickets to Harvesting Hope are $150, and VIP are $200. You can also get together a group of friends and save money by purchasing the Group of 8 pack for $1,000 ($1,250 for VIP). Tickets can be purchased online here. Or, you can win two Individual Tickets here. Use the form below for multiple ways to enter the random giveaway. A winner will be announced on Friday. Disclosure: I was provided with four Individual Tickets in exchange for this ticket giveaway and an event recap post. All opinions stated are 100% my own. I did it! Mr. H and I tasked ourselves with completing the official Tour de Bruell for the first time this summer. And...we did it! Cleveland restaurateur Zack Bruell annually launches the Tour de Bruell. Diners receive a punch card at one of his signature restaurants, and then you have between Memorial Day and Labor Day to visit each of his six signature restaurants. You must order an entree at each, and you receive a stamp on your card to mark your visit at that restaurant. If you complete the tour before Labor Day, you're entered to win a raffle for a four-course dinner prepared in your home for 8 guests by chef Bruell himself. Also, everyone that completes it is invited to a complimentary VIP party in the fall. This year marked the seventh year of the Tour de Bruell, and we did it! His restaurants are some of my favorite in Cleveland, so we had quite a lot of fun getting to all six this summer. We started at Parallax, and I had the seared ahi tuna with lemon puree, sushi rice, and shishito fried vegetables. This was probably my favorite dish of the Tour, and a great way to kick it off. I was dreaming about that lemon puree for weeks. Next up was Chinato, and I ordered the braised lamb with sweet potato gnocchi, Brussels sprouts and Parmesan. Alley Cat was the perfect next stop, because of its riverfront views and summery vibe. I ordered the grilled octopus with succotash, bacon and smoked paprika aioli. Our most disappointing meal was at Cowell and Hubbard. I had the strip steak with roasted baby potatoes and creamed leeks in a foie gras jus. Then, we dined at Table 45, and I enjoyed the plancha seared scallops with miso glazed scallops, bamboo rice, bok choy, sweet tamari gastrigue, and shiso cream ($28) from the new chef Matthew Anderson. We saved the best for last. Our favorite of his signature restaurants, L'Albatros. The lighting was poor, so I don't have a picture of the delicious duck confit with a crispy duck leg, sweet potato puree, and braised cabbage ($24). Of course, we had to end the meal there with the famous cheese service. It was the perfect ending to the tour, and right in time. We dined there just days before Labor Day! Phew, it was a whirlwind of a summer, but thanks to the Tour de Bruell...it was a tasty one. Nothing to disclose here, we chose to do the Tour on our own, and had a lot of fun challenging ourselves to complete it. You can almost never go wrong with food from Bruell's group, and so we really enjoyed completing the Tour. Don't miss out next summer!